Student science fairs and exhibitions have tended to be seen as optional extras, undertaken by particularly keen students, with some schools having strong track records in encouraging participation. 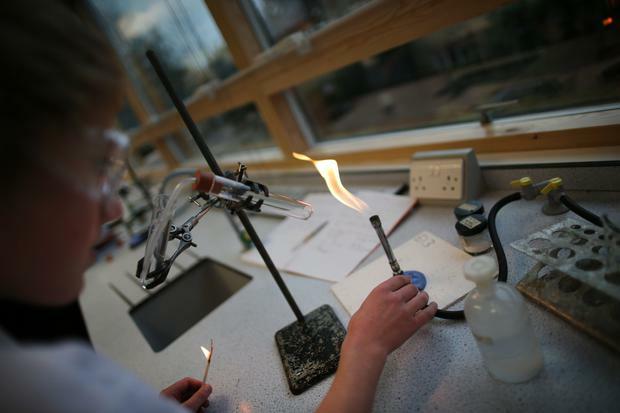 Reforms to junior cycle, which are now in play for science students, look set to change all that and make entry to such contests a natural part of student life. Assessment in science is being transformed, as it is for all subjects at Junior Cycle. Under the new regime, as well as a traditional-style written exam at the end of third year, there will be two classroom-based assessments (CBA). The CBAs will require students to demonstrate their investigation and communication skills in science while developing their knowledge and understanding of the subject. One CBA will be undertaken at the end of second year over a three-week period designated by the State Examinations Commission (SEC). Current second years will be the first to do this assessment - called an Extended Experimental Investigation (EEI) - before the end of the school year. Pupils will have to come up with a scientific hypothesis and then plan and conduct an experimental investigation to test it. It will involve the generation and analysis of data by the student and their reflection on the process, with support/guidance by the teacher. The range of topics for investigation include water, chemical reactions, earth/sun/moon, plastics, energy, food and plant behaviour. The second science CBA, a Science in Society investigation (SSI), is pencilled in for the end of first term or early in the second term in third year. Again, students will have three weeks to research a scientific issue and its impact on society. They will have to analyse and evaluate the information collected and draw conclusions based on the evidence. Pupils choose how they present their research and findings to teachers, whose evaluation of the projects will be incorporated in the Junior Cycle Profile of Achievement (JCPA), which has replaced the Junior Cert. Students will also sit a traditional written exam at the end of third year, to be marked by the State Examinations Commission (SEC). Developing the sort of critical thinking skills involved in inquiry-based learning, such as a science investigation, and the communications skills to talk about it, are central to the ambitions of the junior cycle reforms. As in the oral communication CBA for English - the first subject to undergo reforms in teaching and assessment - science students can choose how they present their work. While it can be a written report, they are also challenged to think about showcasing their research and findings by creating a webpage, building a model, recording a podcast or using a variety of different modes. The variety of presentation formats that students are now being asked to consider is quite a change from the pre-existing arrangements for school-based practical work for Junior Cert science, where reports were written up and presented in a standard booklet. With oral presentations now embedded in assessment in English, many students may decide to use those skills to be adventurous about how they report on science CBAs. Taking it a step further, Junior Cycle for Teachers (JCT), the support programme for the curricular reforms, suggests students should be encouraged to use the evidence of learning presented for the science CBA, as part of an entry to a local or national science fair. Student science fairs have been around in Ireland since the origins of the BT Young Scientist and Technology Exhibition in the 1960s. More have come on the scene since then for students at second level, as well as primary level. One such is SciFest, which has seen more than 50,000 students participate since it launched in 2008. There has been an average year-on-year increase of 23pc in numbers, showing the growing appetite for such initiatives. SciFest is funded primarily by Science Foundation Ireland, Boston Scientific and Intel Ireland. SciFest offers second-level students an opportunity to showcase science, technology, engineering and maths (STEM) projects at a series of one-day science fairs held locally in schools and regionally in the 14 institutes of technology, Dublin City University (DCU) and St Mary's College, Derry. Past winners have included students from small rural schools and schools in the Deparment of Education's DEIS scheme for disadvantaged communities. Some schools use a mini SciFest at school to select projects to enter into the regional finals in the institutes of technology, although it is possible to enter directly into the regional rounds if a school or student so desires. The winners from each regional fair compete at a national final held annually in November and the winner there goes on to represent Ireland at the Intel International Science and Engineering Fair (ISEF). The winner of SciFest 2018 will travel to Phoenix, Arizona for the event. Application for SciFest 2018 has opened and completed entries must be submitted by Friday, March 9 or, in the case of St Mary's College, Derry, by Friday, May 11. All necessary information is on scifest.ie. SciFest founder and CEO, Dr Sheila Porter, said the contest aims to give students of all abilities the opportunity to develop research, problem solving, critical thinking and presentation skills. Last year, more than 10,000 students participated across the country and Dr Porter is hoping more will get involved this year.